Atlanta is preparing to host the Super Bowl. Artists there are painting murals that highlight the city's civil rights and social justice legacy. The game will be played at a downtown stadium. Artwork adorns the neighborhoods near the stadium. It is part of an initiative called "Off The Wall: Atlanta's Civil Rights and Social Justice Journey." The project is a collaboration between arts advocacy group WonderRoot and the Super Bowl host committee. 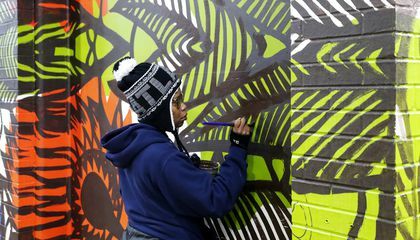 While the murals' installation was timed to coincide with the Feb. 3 sports extravaganza, they are meant to be lasting public works of art for Atlantans. They should enjoy them long after the football fans have left. According to WonderRoot's executive director Chris Appleton, the idea was to celebrate Atlanta's role in the civil rights struggle of the 1950s and 1960s. It is intended to connect that rich legacy with more contemporary struggles for justice and equality. The term "beloved community" was made popular by the Rev. Martin Luther King Jr., an Atlanta native. He described a society centered on equal opportunity and justice and rooted in the philosophy of nonviolence. Several dozen "community conversations" brought out unheard and untold stories about the struggle for justice that needed to be elevated. That's according to Appleton. The artists sat in on those conversations and used them to inform their mural designs. The designs then went through two rounds of community feedback. "I really believe the artists have done a great job of amplifying and complexifying narratives around justice issues in Atlanta and beyond," said Appleton. "The murals, as a collection, are celebratory in some cases. They are aspirational in some cases and are rooted in truth-telling." A nomination and selection committee invited artists from around the country to apply. The panel chose 10 applicants. An 11th spot, dubbed "Atlanta's choice," was open only to Atlanta area artists. It was voted on by the public. In total, they plan to install roughly 30 murals. Muhammad Yungai was the muralist selected by public vote. He drew inspiration from a community conversation held at Spelman College where he learned about students who volunteered at a nearby community farm. 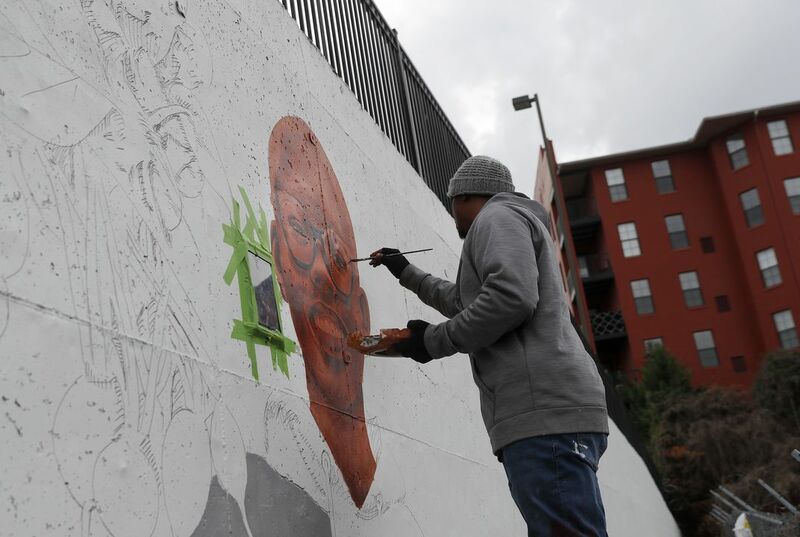 His mural, "Community Roots," is on a wall in Atlanta's Castleberry Hill neighborhood. It showcases actual students from four historically black colleges and universities in Atlanta and the produce they help grow. The schools include Spelman, Morehouse, Clark Atlanta and Morris Brown. He wanted to shine a light on the four schools, which sit a stone's throw from Mercedes Benz Stadium, where the Super Bowl will be played. He also wanted to shine a light on urban farming and community gardening. The 44-year-old middle school art teacher and professional muralist said his work often focuses on education. Shanequa Gay, 40, was inspired by a community conversation at Covenant House. It provides housing and support for homeless young people. Her mural, "Excuse me while I kiss the sky," adorns the walls of the Vine City transit station, across the street from the stadium. Gay said she wanted to represent people who sleep under the trees and bushes. Dark outlines of leaves and flowers that she said are inspired by Georgia's abundant vegetation are layered over brightly colored profiles of young people she met at Covenant House.